We have 11 trails (35K) for classic skiing, skating or snowshoeing. There are trails for easy to expert abilities. Many of our trails are wooded but also have some in wide open meadows with beautiful views. 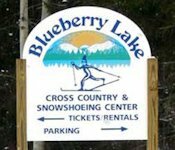 There are complete ski and snowshoe rentals and lessons at the center. Please phone ahead of time if you would like a lesson. All trails are engineered and graded for the average skier’s ultimate enjoyment — set skating width with heavy duty track setting equipment for the best in tracks. The trails are groomed most every day. /Groomed 34kmPrimary Surface Condition: *Groomed - Trail/Loop Pick of the Day: 1,2,3,4...6,7,8 - Open: 34.83 KM - Groomed: 34.00 KM - Snow Past 7 Days: 40.00 in - Snow Base Depth: 12-18 in - Upper Elevation Snow Depth: 40-50 in - Wednesday, January 30th.. We received another foot of snow overnight. We are skiing with excellent conditionss this week ...more snow in the forecast..
Spring skiing has arrived; cool nights mean glazed surfaces in the evenings & mornings. Strong sun softens the snow during the day.